6 / 7 / 8 / 9 July 2016; PSi #22 ‘Performance Climates‘, Melbourne programme of performance research events. Four days of the PSi #22 conference ‘Performance Climates’ provided the impetus to monitor, record, and re-distribute interrelationships between the dramaturgy of conference organization, vectors of individual participation, circumstantial happenings, and microclimates of experience. We were interested in undertaking score-based processes of collection and transformation in order to sample, remix, and re-release what may have been overheard, what may have escaped our awareness, what materialities might resonate, and what might be left unsaid. Working with sound artist Simon Maisch, we created a daily process of gathering sound samples; arranging these into different layers or categories; transferring these to a pre-scripted process of transformation, as if thrown into a system of climate affects; and then releasing each Daily Hearing back into the atmosphere of the conference via online streaming access at 10pm each evening, offering a sonic reverie of the day, perhaps to fall asleep to. 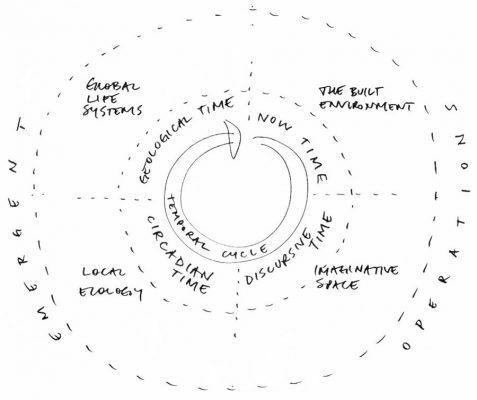 ‘Now time’ / the built environment. This might include glitches, machinery, electronics, actants of any kind, doorways, building sounds, etc., that could be repeated, accumulate, interfere, and provide a pulse to the sound score. ‘Discursive time’ / imaginative space. Based on notes from sessions, slides projected during talks, and other textual elements, at the end of each day we recorded new fragments of spoken word. Working within limited time constraint, we selected and improvised from these texts in ways that sought to respond to the four themes of the four days of the conference: Day 1-Weather and Events; Day 2-Land and Durations; Day 3-Habitat and Environments; Day 4-Atmosphere and Affects. ‘Circadian time’ / local ecology. This layer included ambient sounds from urban life surrounding the university campus, and sounds made by nonhuman species. ‘Geological time’ / global life systems. 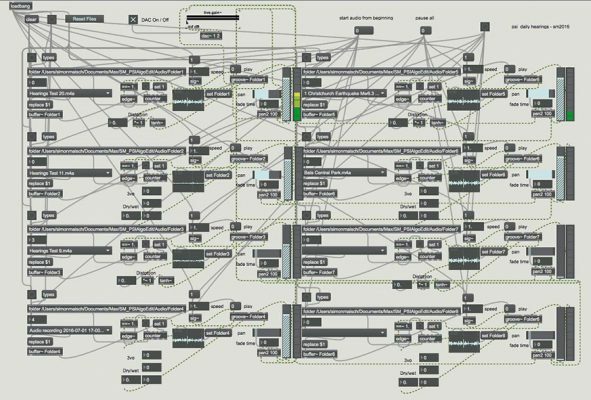 This layer included our own field recordings and sounds sourced from the internet that we felt spoke to longer timescales of biosystems. Keywords which we used to generate sonic equivalents included swell, periodicity, peak, drift, vorticity, decay, entropy, feedback loops, pulse, life cycles. Each of the Daily Hearings combines chance operations applied to each source file with an overall structure that creates a gradual progression by which, over 30 minutes, elements from ‘now time’ and ‘discursive time’ are subsumed within the sound-system, and elements from ‘circadian time’ and eventually ‘geological time’ slowly rise from the background to a more prominent role. We thought of this as expanding the circle of listening from the local to the global, or from a spatial sense of nearness to spatial sense of farness, as listeners drift off to sleep. The process enacted forms of call and response, uttering and listening, listening and re-listening, which became coincidentally amplified in the focus of Rebecca Schneider’s closing address to the conference on the last day. Along the way, we made our own discoveries about the ‘atmospheres’ we were creating (informed by the daily conference themes), which led to choices such as only including sources that were spoken by the human voice in day 3, and, conversely, using a fragment from Schneider’s keynote (“and this, another call…”) as the primary discernible voice in day 4. Theron Schmidt is a writer, teacher, and performer, currently working at UNSW Australia in Sydney. Simon Maisch is an audio engineer, musician and sound artist in Melbourne.